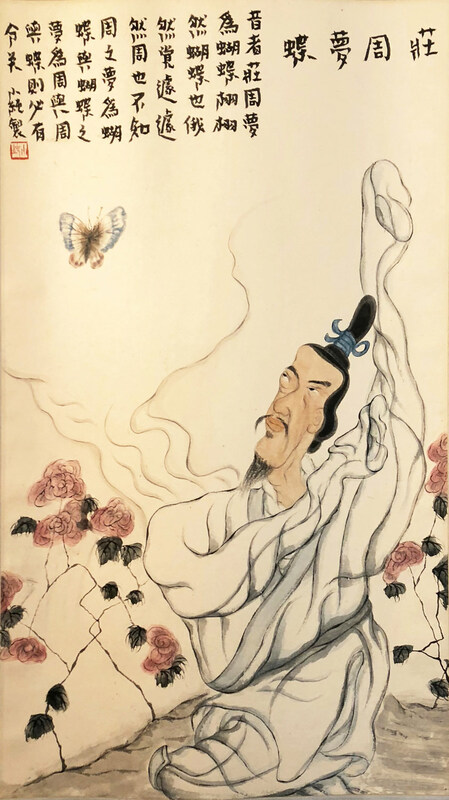 The story of Zhuangzi's butterfly dream comes from Qi Wu Lun, the second chapter of the book of Zhuangzi.4 The story, of Zhuangzi dreaming he was a butterfly but upon awakening not knowing whether in fact he was a butterfly dreaming he was Zhuangzi, has long been popular. It became associated with at least two qin melodies, the present one and the one that comes before it, #59 Shenhua Yin (Metamorphosis). However, neither title nor any of its known variations appears in recognizable form on any of the pre-Ming qin melody title lists. On other other hand, after their first appearances here in 1425, both melodies became very popular, with versions of Zhuang Zhou Meng Die (under several different titles) surviving in over 45 qin handbooks through 1946 and versions of Shenhua Yin surviving in at least 35 handbooks through 1914.5 Both melodies are in shangjiao mode, an otherwise uncommon mode title. Many handbooks have versions of both. On the other hand, although all the melodies traced here in the chart below are related, at least throughout the earliest surviving tablatures, there seems to be an unusual amount of variety. This may be due to differing interpretations of the unusual harmonics as presented in Section 1. And perhaps this in turn inspired different developments in later versions; or perhaps it was the popularity of the subject that kept people working out new variations. The most noticeable characteristic of Section 1, which is in harmonics, is the number of harmonics played at the eighth node (hui). These notes all have an intonation slightly different from harmonics played in the more common positions.6 Most early versions after 1425 changed the tablature so that the number of these "odd" notes was decreased and eventually eliminated. This raises questions about attitudes towards intonation; in particular, were qin players becoming more conservative, more confined in their approach? In modern times people have tried in vain to figure out a way to re-tune the qin to avoid playing such "dissonances", but in my imagination this sort of musical rule breaking (or re-thinking) that led to these dissonances evokes the sort of iconoclasms expressed by Zhuangzi himself. In addition, the tonality can give the music a sort of ethereal quality appropriate to evoking butterflies and their metamorphosis. Early claims connecting Zhuangzi7 and the qin include his association with the melody Zhuangzhou Duchu Yin,8 listed among the qin melodies of Cai Yong (Hejian Zage, #16). In addition to my own recording, the Shen Qi Mi Pu version has also been recorded by Chen Changlin, Wang Duo and Li Feng. this piece existed in antiquity, but for a long time it had not been transmitted, (until the Song dynasty's) Mao Minzhong continued it. The (first section of the) book Zhuangzi says, "(I) Zhuangzi once dreamed I was a butterfly, a butterfly fluttering about..., not knowing about Zhuangzi. Suddenly I woke up, glad to find I was still Zhuangzi. (But) I didn't know whether I had dreamed that I was a butterfly, or was a butterfly dreaming of being Zhuangzi. There must be a difference between Zhuangzi and a butterfly, and this is what is called "material transformation." Thus a gentleman who can attain the Dao shrinks that which has been created beyond objective existence, (instead) using his spirit to guide his life force, wandering pleasantly in a broad, quietly empty place, going along with all the changes in heaven and on earth, and being of one substance with the Universe. This pleasure is not the sort an ordinary bumpkin can know; (only) men of distinction attain it. 31795.65 Zhuangzhou zhi meng 莊周之夢 has Zhuangzi's dream; nothing about music. Other titles used include Hudie Meng 蝴蝶夢 38085.10 name of two operas, one Yuan, one Qing), Diemeng Yin (38086.51 diemeng, nothing on music) and Meng Die (5935.137 nothing on music); the alternate titles for Shenhua Yin can be very similar. The calligraphic inscription copies the Shen Qi Mi Pu Preface. Note that the chapter title Qi Wu Lun has various translations. Legge, following the tradition that the characters should be grouped Qi Wulun, translates it as The Adjustment of Controversies. Another tradition groups the characters as Qiwu Lun; the translation by Burton Watson (Columbia University Press [Amazon]), following this, translates the section title Discussion on Making All Things Equal. The chapter also mentions "昭文之鼓琴 the qin play of Zhao Wen". For 莊周夢蝶 Zhuang Zhou Meng Die, Zha's Guide (10/97/147) on p. 10 lists 39 handbooks, giving 蝴蝶夢 Hudie Meng and 夢蝶 Meng Die as alternate titles; another alternate is 夢蝶遊 Meng Die You (1859). One of the later occurences is the revised version of Zhuang Zhou Meng Die in Tianwen'ge Qinpu. That handbook also has a musically unrelated melody called 化蝶 Hua Die (Butterfly Transformation), attributed to Zhang Kongshan. Harmonics at the 8th node (as well as the 3rd, 6th and 11th nodes) give notes based in natural tuning rather than in the Pythagorean system (Chinese sanfen sunyi) used for the notes in other positions. For example, if the tuning (as here) is 1 2 4 5 6 1 2, notes played in harmonics at node 11 on the first string and at node 9 on the fifth string are both 3 (mi) but if the pitch of 1 (do) is 120 Hz., then that of the 11th node mi will be 300 Hz. while that of the 9th node mi will be 304 Hz. If these two notes are played in sequence then this may be perceived as a dissonance. This is discussed in more detail under Tuning a Qin. In Section 1 the changed notes are 3, 6 and 7 (mi, la and ti). The other section in harmonics, Section 4, has several notes including a 長鎖 changsuo in the 11th position. One can speculate that these were changed because the notes played at the natural tuning nodes were perceived as dissonances. Some of the inconsistenceies in early versions might also have been due to copy issues caused by the fact that in qin tablature an unclearly written or printed 11 may be confused with a 7. In any case, from my experiences these dissonances when used sparingly are actually quite striking and beautiful, and so were an essential element in early qin music. See Zhuangzi and the footnote below. For the original text see 莊周夢蝶. 1. 夢占; 2. 蝶化; 3. 周蝶; 4. 蝶周; 5. 燕游（已上分開第六段全要見栩栩之意）; 6. 敘氣; 7. 覺分; 8. 物化. 1. 息慮; 2. 黑甜; 3. 神遊; 4. 物化; 5. 舉翅; 6. 翻風; 7. 恍惚; 8. 悠揚; 9. 夢醒; 10. 蘧然; 11. 悟性; 12. 忘性. 1. 世慮俱忘; 2. 雲牕高卧; 3. 夢為蝴蝶; 4. 形神俱化; 5. 周為蝴蝶; 6. none; 7. none; 8. none. 1. 夢占; 2. 蝶化; 3. 周蝶; 4. 蝶周; 5. 燕洊; 6. 叙氣; 7. 覺分; 8. 物化. 1. 吉夢佳占; 2. 蝶化栩栩; 3. 周之為蝶; 4. 蝶之為周; 5. 燕遊天地; 6. 馭氣淩空; 7. 覺分人物; 8. 物物生生. 1525 and 1585 not yet translated. Almost all qin melodies end on harmonics, even if only the final note. In early pieces this closing passage is often taken from the modal prelude, and rather than writing this out there are simply instructions to "play the harmonics from the modal prelude". Here in the 1425 Zhuangzhou Meng Die it is quite possible that these instructions were omitted by oversight. (Is it significant that the preceding piece, Shenhua Yin, also has no closing harmonics indicated?) In any case, almost all the tablatures after 1425 that I have examined, including those of 1491 and 1556, which otherwise seem to be copies of the 1425 tablature, include closing harmonics (the exception is 1530, another copy of 1425). (1573; #66) Same as 1585? (1579; IV/244) 8; related but quite different (expanded? ); above title is written "附 fu": attachment? "蓮舟和尚傳 transmitted by Monk Lianchou"; "馬龍文授 received from Ma Longwen"
(>1802; XIX/96) 13; harmonics S1 & S5; "from 1722"